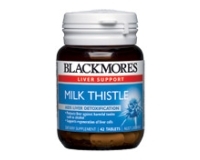 Blackmores Milk Thistle aids normal liver function, as well as protecting liver cells through its strong antioxidant activity. Traditionally used as a detoxifying agent, milk thistle supports regeneration of liver cells and protects against potentially harmful substances such as alcohol. May occasionally cause a mild laxative effect.